I’ve hesitated to ever write an article about raising kids. Why? Because of the fear of being judged. What if you disagree with me? What if one of my kids royally messes up, gets in trouble and everyone I know who’s read this says “See, she didn’t know what she was talking about after all“? I’ve decided to put my unfounded fear aside and realize that I have three amazing, fun, creative, honest and sweet kids which is because of a mixture of reasons. One of those being mine and my husband’s relationship with them. That’s something I should be proud of. Our three kids are 17, 15 and 10 and I have people ask me all the time “What the heck did/are you doing to have such great kids? What’s your secret?” Now, I realize my kids still have many, many years of life left to live. They’ll make huge mistakes. They’ll get mad at me. They may even go through seasons of not wanting to talk to me. I pray that doesn’t happen, but I also don’t need it to be a complete reflection of myself and my parenting. Because, if I do say so myself, I think my husband and I are doing a dang good job at raising them. There, I said it. Are there things we could do better? Yes, on a daily basis. Will I mess up, say something I shouldn’t and hurt their feelings? Yes, most likely sometime this week. But, no matter how bad my kids mess up or how bad I mess up, there’s a solid relationship between us as a foundation. And that’s HUGE. 1. Realize you can not be the only positive influence in your kids’ lives. Whether it’s a teacher, coach, another parent, club leader or youth pastor, it’s extremely important that your kids have many positive adult influences in their life. We actually encourage our kids to build these relationships and I am thankful to say they have other adults who invest in them. They take them to coffee, encourage them with their words and work with them on building leadership qualities. My kids also know these adults expect a lot of them and my they respect them. It does take a village, and that doesn’t in any way reflect on your parenting. It’s actually the opposite. Allowing other adults to pour into your kids shows that you understand what it takes to raise great kids. It shows you get it and it shows that you care, and it shows that you understand it’s not all about you…it’s about doing the absolute best thing for your kids. 2. Laugh. Have fun. Be silly. There are some weeks my husband and I ask each other if we’ve laughed or had fun with our kids. It’s so easy to get caught up in the busyness of school, activities, work, stress and everything that life throws at us. But I can promise you, there is something magical in the midst of all of this when you just take the time to have fun. Watch a funny movie. Play a game. Talk about something funny that happened that day. Laugh at yourself. Just relax and have some fun. Admitting you’re wrong and saying you’re sorry can be really difficult sometimes. My pride gets in the way. Oh that pride! But there are days I hurt my kids’ feelings or I make a decision that looking back on (I later realize?) wasn’t the right decision – and these things require apologizing (from the heart). How can we expect our kids to learn to say they’re sorry and own up to their own mistakes if we don’t teach (model it for) them? Day one, when that little baby is placed in your arms, parenting is all about teaching and correcting. We had to teach our first child that sleeping through the night, and not through the day, was a very good thing. And necessary for her parents’ survival! Then the toddler years come and sometimes we feel all we’re doing is teaching, correcting, teaching and correcting. But even when they’re toddlers and definitely as they get into their middle school and high school years, doing less correcting and more complimenting is huge. They need to hear you say positive things about them. They actually want it. I try to give my kids’ compliments several times a day. Do I fail? Oh my goodness yes. But I can tell a difference on the days that I don’t. Tell your daughter she is beautiful. Tell her you’re so proud of how good she’s doing in school or how amazed you are at her creativity. Tell your son how handsome he looks. Tell him that he comes up with great ideas or treats people kindly. Tell him when you’re proud of something he’s done. You’ll be thankful you made an effort to do this. I’ve heard on many occasions our kids complimenting someone else, and that’s a very good feeling. 5. Spend one-on-one time with them. This has been a hard one for my husband and I, and something we’re always aware that we need to work on. I spend quite a bit of one on one time with my daughter because we’ll go shopping together and she likes to run errands with me. But when it comes to my sons, I have to really make an effort. As our kids get older, we’re realizing how we have to schedule this time in or it just won’t happen. Our two oldest kids have very active social lives, so we have to plan time with them, before they plan it with someone else. One thing we’ve done that has made a world of difference, is spending one-on-one time with our kids when we notice something is off. Are they more irritated than usual? Are they snapping at everyone around them? Are their grades slipping? Are they more tired than usual? We know our kids well enough to realize something is going on in their lives and they need to talk about it. The change in them after a movie, dinner or coffee date with one of us is amazing. It changes the atmosphere in our home and it shows our kids that we’re on their side. At the end of the day, if they can’t believe that one thing, then all the parenting advice in the world is utterly worthless. Now it’s your turn to share. 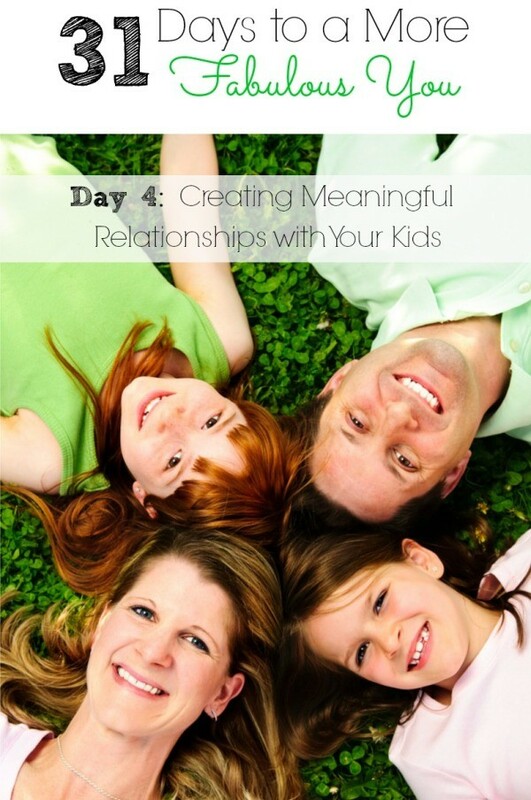 What do you do to create meaningful relationships with your kids? Or what is something your parents did that made a difference in your life? Stay tuned for Day 5 of 31 Days to a More Fabulous You….